ATTACKS ON POLICE INCREASING IN AFTERMATH OF FERGUSON! A cop in Flagstaff, Arizona was gunned down over the weekend. Tyler Stewart, a 24 year old rookie officer died after being shot at close range while responding to a domestic violence call. The coward responsible for his murder went on to take his own miserable life rather than face justice. This follows the shooting death last weekend of Tarpon Springs, Florida officer Charles Kondek – a father of five who was murdered before Christmas – and the execution of two New York City cops as they sat in their car. Now reports have come in of a series of gunshots fired at law enforcement officers across the nation. A week after two New York City officers were killed while sitting in their patrol car, more police across the country are getting shot at. In Los Angeles, two officers were driving in their patrol car Sunday night when at least one gunman opened fire, police said. The officers returned fire and were not injured. One suspect was arrested, and police recovered two weapons — including a rifle. But a second suspect remains at large, prompting an hours-long manhunt involving about 100 officers, Los Angeles police Capt. Lillian Carranza said. Police warned residents to stay indoors part of South Central Los Angeles. And in Pasco County, Florida, someone fired three bullets toward two sheriff’s deputies as they were sitting in their cars Sunday morning, the Pasco County Sheriff’s Office said. The Pasco County Sheriff’s Office is also searching for whoever spray-painted graffiti reading, “Shoot MP Cop.” The graffiti was written on a road barrier in a subdivision called Meadow Point. 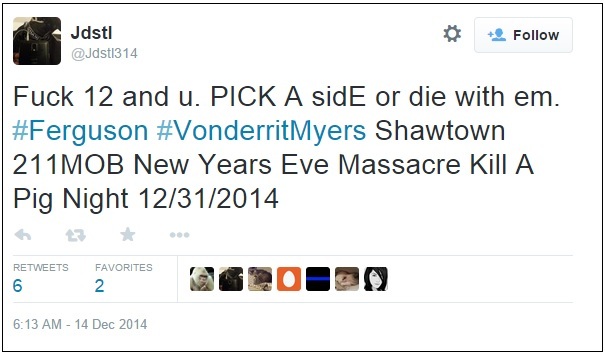 It has also been reported by the conservative website The Gateway Pundit that a Ferguson protester has posted an ominous message on Twitter calling for a “New Year’s Eve Massacre Kill a Pig Night”. How in the hell have we gotten to the brink of this pit of darkness? It is never, ever acceptable to kill police officers in any civilized society, to embark upon that path is to take a step towards anarchy and what is currently going on in the U.S. is setting the stage for perilous and ugly times. Punks and thugs seem to believe that it is open season on the cops while giving little thought to the inevitable blowback that is surely coming. What started out as a serious effort to address the post 9/11 militarization of American police into something that more fittingly belonged in a war zone than on American streets was quickly hijacked by race pimps and charlatans for their own agendas. The insertion of themselves into the Michael Brown shooting in Ferguson by Emperor Barack Obama and his vicious hatchet man Eric Holder -solely for political reasons- only served to throw gasoline on the fire. I suspect that a good deal of the racial politics were due to the November mid-term elections and the necessity for the Democrats to pander to the black vote but in doing so, national authority figures put their seal of approval on what was to come. Once professional athletes adopted thug worship as a part of their repertoire – note the St. Louis Rams players pregame Michael Brown salute – the die was cast. Whether celebrities accept it or not they are role models to millions whose need to live vicariously through pro athletes etc. is only exceeded by their inability to think critically. Now instead of having that long overdue national conversation on militarizing the police there are angry freaks who are going rogue only serve to prove the case that the streets are the equivalent to a battlefield. There is a disturbing phenomenon that unfortunately must be addressed. Criminals and their supporters are creating chaos and undermining peaceful efforts to step back the police state. On June 8th, Jerad Miller and his wife Amandawalked into a Las Vegas restaurant and murdered two police officers while they ate lunch. On July 13th, Lawrence Campbell staged an ambush at a Jersey City pharmacy and murdered a police officer who responded to the call. On September 12th, Eric Frein used a rifle to ambush and murder a Pennsylvania State Trooper as he walked to his car. On December 20th, Ismaaiyl Brinsley walked up to a police cruiser and murdered the two officers sitting inside it. In each case, the perpetrator(s) sought out police officers at random with the express purpose of murdering them because of their profession. Each perpetrator initiated the confrontation. Each committed a deliberate, cowardly attack on people who had done nothing and had no chance to defend themselves. This author wishes to be distinguished from those who might rationalize murder. For a variety of reasons, such behavior — and sympathy for it — violates every principle of logic and morality and is bound to result in political failure. Those who wish for a less intrusive, abusive government need to win public support. The people must be convinced of the problems that stem from being over-policed, and the virtues of being left alone. Their perceptions of current events will play a large role in determining how much government they tolerate. The media plays a significant — if not complete — role in shaping this public perception. Psychologically, most people are apt to side with the side which they perceive to be the victim; against the bully. When random malcontents take shots at the police, they are creating the ideal circumstance for the government to express its victimhood at the hands of “anti-government” protesters. The media heavily carries this sentiment and quickly turns the public toward the side of the police and the government. Consequently, these events give the government a sufficient excuse to uphold aggressive police tactics and the procurement of more militarized equipment. Such chaos reinforces a climate of danger and fear that the government readily uses to maintain its power. The same can be said of rioters, like the ones that set dozens of buildings ablaze in Ferguson, Missouri. Such wanton destruction only caused the people to demand more security from the police. The disgusting murders of law enforcement officers by scumbags only serve to further cement the police state into place. The war on drugs as well as the overreaction to the September 11, 2001 attacks put the country on a path to big government fascism that was going to be hard enough to reverse before the current climate of police shootings and heated rhetoric. The only thing that the angry useful idiots who cluelessly march to the drumbeat of self-serving demagogues will ultimately result in is even more Draconian measures that will only diminish whatever freedom that we still enjoy in The Homeland.